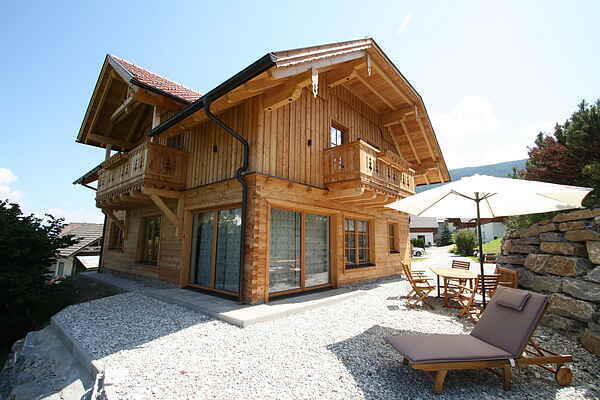 This exclusive and high-quality chalet is right by the Aineck piste. 200 Meters from the Katschberg. The detached chalet offers you lots of privacy with the garden to the south west and direct view of the ski piste. The chalet was newly built in 2016 and has a high quality interior, with for example, a flat screen television with internet in each bedroom. The spacious living room and large dining table offer enough space for 8 people and give you a spacious feel thanks to the large windows. The open fire in the middle of the living room makes it very atmospheric. With lots of tailor-made wooden furniture and finishings, you will find yourself in a modern, but authentic Austrian chalet. An absolute must in the perfect location for winter sports. In summer the surroundings also have more than enough to offer, such as as a beautiful golf course, hiking and mountain biking from the chalet and near the many beautiful lakes in Carinthia.